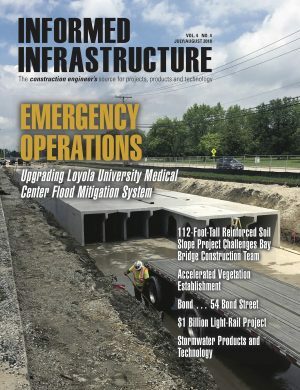 By Peter Baumann, Jacobs University Bremen, chair of the Open Geospatial Consortium (OGC) Web Coverage Service Standards Working Group, and Lance McKee, OGC senior staff writer. his year marks the 20th anniversary of the founding of the Open Geospatial Consortium (OGC), an international industry consortium of 477 companies, government agencies and universities participating in a consensus process to develop publicly available interface standards. of processing functions in the cloud ecosystem; open interfaces to publish/find/assess/access/use sensors and sensor data; and use of Web browsers for fine-grained searches of Earth observation data sets on the Web. Progress rapidly continues. Founded in 1994, OGC received early funding through a NASA Cooperative Agreement Notice. NASA has been a Principal Member since 1998 and a Strategic Member since 2002. In 1995, OGC created an Earth Imaging Working Group, whose expert members began working on standards that enable interoperability among Earth imaging systems as well as between Earth imaging systems and other kinds of systems. OGC developed relationships in the 1990s with the IEEE Geoscience and Remote Sensing Society, the International Society for Photogrammetry and Remote Sensing, the American Geophysical Union and the SPIE. In 1997, OGC formed a World Wide Web Mapping Special Interest Group, which gave rise to the 1999 Web Mapping Testbed Phase 1 (WMT1). This rapid prototyping initiative produced the OGC Web Map Server (WMS) Interface Standard. WMS was the first practical result of member consensus on the OGC’s basic Web strategy and led to the OGC’s Interoperability Program of testbeds, pilot projects and other initiatives that accelerate the development and deployment of OGC standards. The European Space Agency (ESA) has played a critical role in advancing standards for Earth imaging information technologies by substantially financing standards development, such as the OGC Web Coverage Service (WCS) Standard. There are thousands of public- and private-sector implementations of OGC Web Service (OWS) standards, and many of them serve Earth Imaging data and portrayals derived from Earth imaging data. 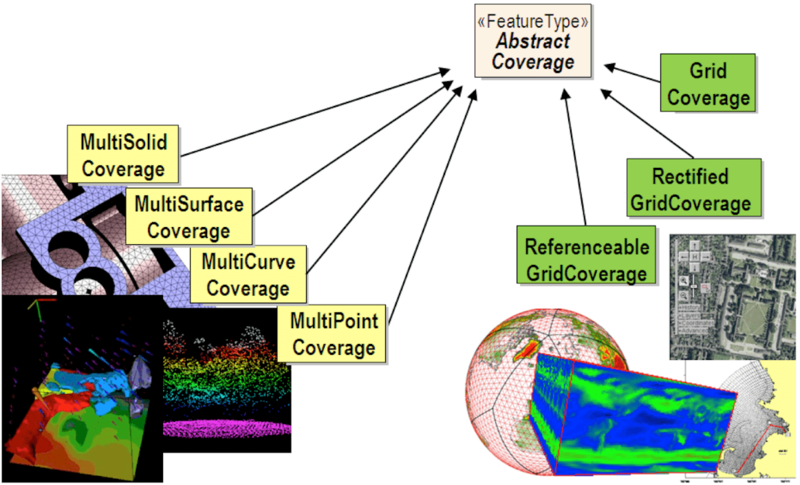 Also in the late 1990s, OGC members focused on the need for an abstract model for “coverages.” The OpenGIS Abstract Specification Topic 6: Schema for coverage geometry and functions provides a definition of coverage as the digital representation of some space/time-varying phenomenon. This includes regular and irregular grids, point clouds and general meshes. Special cases of coverages include raw swath data, image products and image timeseries. Geospatial data and geoprocessing ervices are complex. This specification, which later was adopted by the International Organization for Standardization (ISO) with number 19123, provides a high-level, abstract model, but it isn’t intended to serve as a direct implementation guideline, as it can’t guarantee interoperability. This is the task of the GML 3.2.1. Application Schema—Coverages, nicknamed GMLCOV. Based on the abstract model, GMLCOV provides a concrete coverage model, which is interoperable and can be conformance tested down to the single-pixel level. This model brought clarity to several thorny problems in data publishing, discovery and access. The early vision of “publish/find/bind” for Earth observations is now a reality. Coverages a la GMLCOV on principle can be served by any OGC service supporting features. The most detailed functionality on coverages is offered by the OGC Web Coverage Service interface standard (WCS). Organized around a mandatory Core and optional Extensions, WCS supports operations ranging from simple access, extraction and format encoding to advanced ad-hoc analytics. 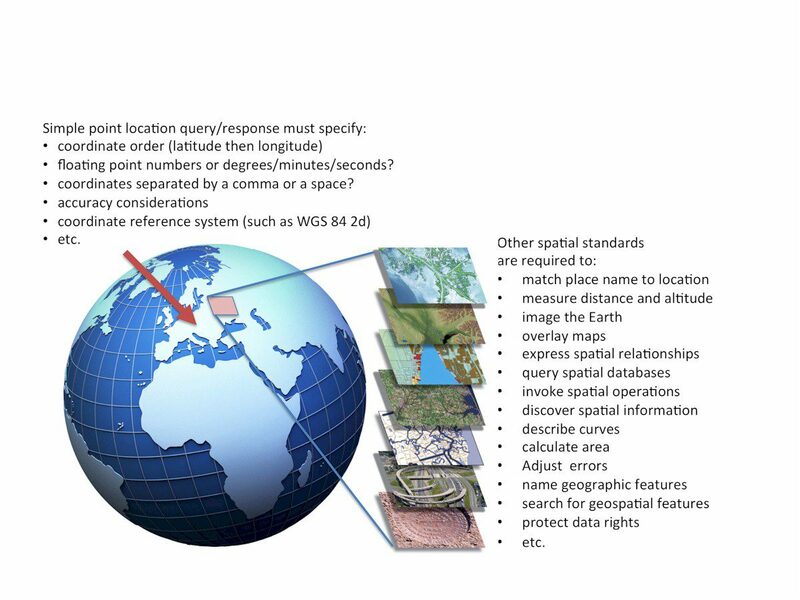 WCS thereby makes many Earth imaging workflows simpler. For example, WCS enables applications, with the same service interface, to query raster and point cloud data. Among the WCS extensions available are band (channel, variable) extraction, scaling, interpolation, coordinate reference system (CRS) transformation and processing. The latter is achieved through a high-level coverage analytics query language, the Web Coverage Processing Service (WCPS). Application profiles bundle this generic functionality for specific domains. The EO-WCS profile for remote sensing imagery is an adopted OGC WCS profile, and the MetOcean-WCS for climate, meteorology and aviation is under development. This versatility is extremely useful in integrating data of different types from different sources. Security also is being addressed. For example, secured WCS and WCPS access between a NASA server (in the nasa.gov domain) and an ESA server (in the esa.int domain) has been accomplished via an Access Management Federation, without compromising security on any side. Today, standardization, even in its upstream phases, is an open process. The OGC group maintaining GMLCOV, WCS and WCPS publishes its draft for early comments by public stakeholders (members and nonmembers) and provides a single point of information on coverage-related topics. The corresponding Wiki is freely accessible at http://external.opengeospatial.org/twiki_public/CoveragesDWG. OGC also enables Earth observation sensor webs. SensorML is an XML-based Sensor Model Language for describing the geometric, dynamic and radiometric properties of dynamic remote sensors. Due to its generality, SensorML can capture virtually any sensor and transform data into the OGC universe. As a result, SensorML is suitable for upstream tasks, whereas WCS—along with WMS, WFS, WCPS, WPS, etc.—is ideal for serving features and coverages downstream. Since the 1999 Web Mapping Testbed, the OGC Interoperability Program has managed 77 initiatives—mostly testbeds and pilot projects—to accelerate the development of emerging concepts and drive global trends in interoperability by rapidly prototyping new capabilities. Most of these initiatives have an Earth imaging component. In an increasingly connected world, spatial integration and communication are increasingly important. In addition, OGC plays an important role in the Group on Earth Observations (GEO) Global Earth Observation System of Systems (GEOSS). OGC leads the multiyear GEOSS Architecture Implementation Pilot (AIP) using OGC Interoperability Program policy and procedures. Now AIP is in its seventh year. WCS integrates spatio-temporal coverage types. Standards serve the needs of industries, but they also help shape the futures of industries. The scope of OGC activities keeps growing, offering more stakeholders opportunities to participate in this shaping activity. Activity is currently strong in the application domains of smart cities, aviation, law enforcement, emergency management, energy and utilities, climate and consumer apps. Imaging—and imaging standards—are important in all of these. In the recently completed OGC Testbed 10, the broad range of topics included cross-community interoperability, open mobility and aviation, and within each of these there were Earth imaging components. The next OGC testbed, Testbed 11, is likely to look at applications that involve technology domains such as big data analytics, open data, social-location networking, modeling and simulation, points of interest, linked data, mobile location services and the Internet of things. imaging technology to explore opportunities with the OGC.